Today in Minnesota it has been Give to the Max Day — 24 hours of fundraising for nonprofits and charities. It’s a great event … BUT! The focus is on schools and nonprofits in Minnesota. This is all good. Really good. A vast number of Twin Citians come from places like Bottineau, Bismarck, Williston and Fargo. You really can’t throw a rock around the Twin Cities without hitting someone from North Dakota. There are great causes all across North Dakota. We think the Stone Bank is a good one! So. North Dakotan-Twin Citians, why not point some of that generosity to the west? Yep. It’s Day 14 of National Blog Posting Month, and we are asking in plain language for your support. Open your heart to the Stone Bank or another North Dakota nonprofit — and give them a little sugar. We don’t have a great organization like GiveMN making giving cool. But is IS cool. Saving a historic building, supporting your local library or giving to any of a number of causes is totally hip. So share some of the love with a North Dakota cause. 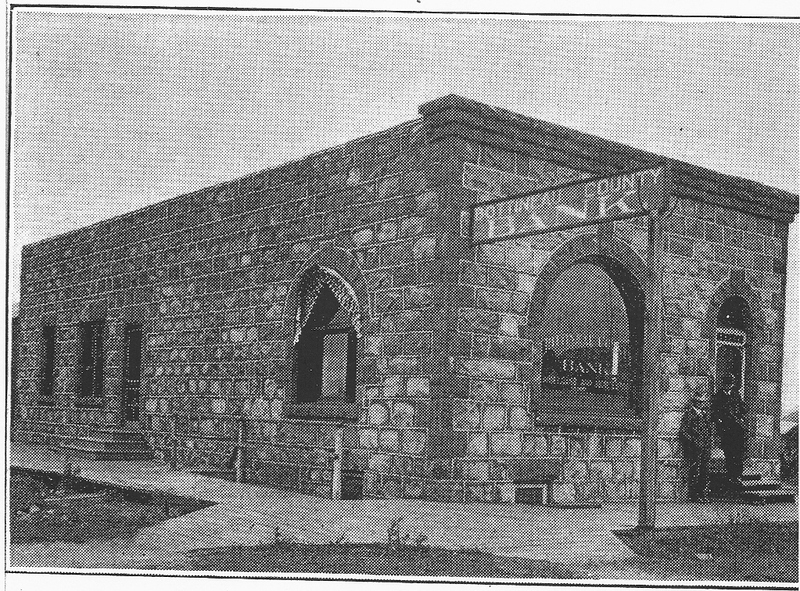 The Stone Bank in 1902. 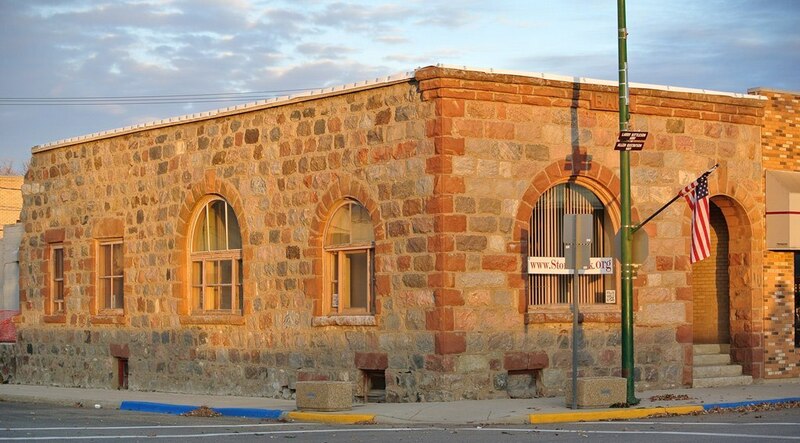 It was then-known as Bottineau County Bank. Or go to our website. You can make a donation through PayPal or Razoo there. Do it for North Dakota. We hope that Labor Day finds you taking a break from work and enjoying the long weekend. Enjoy. At the Stone Bank, we are enjoying the weekend, but we never stop “working” on finding the money to push our project along. How can you help? But a T-shirt. Dedicate a stone or just make a contribution. We have new T’s — red in a women’s cut and blue for men. Only $15. 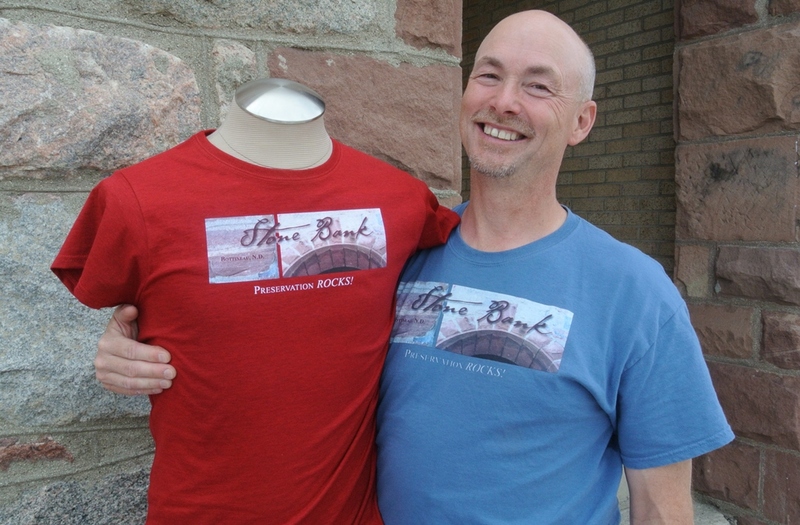 We recently rolled out our new Stone Bank T-shirts and all the really cool people have them. You are SO cool you need one, too. These are 100% cotton T’s and the colors are really great. Linda Heidbreder loves her T-shirt and wears it on “casual Friday” to work. You don’t have to wear your heart on your sleeve, but you can show your support of the Stone Bank restoration by wearing one of our T-shirts. They really look great with jeans. 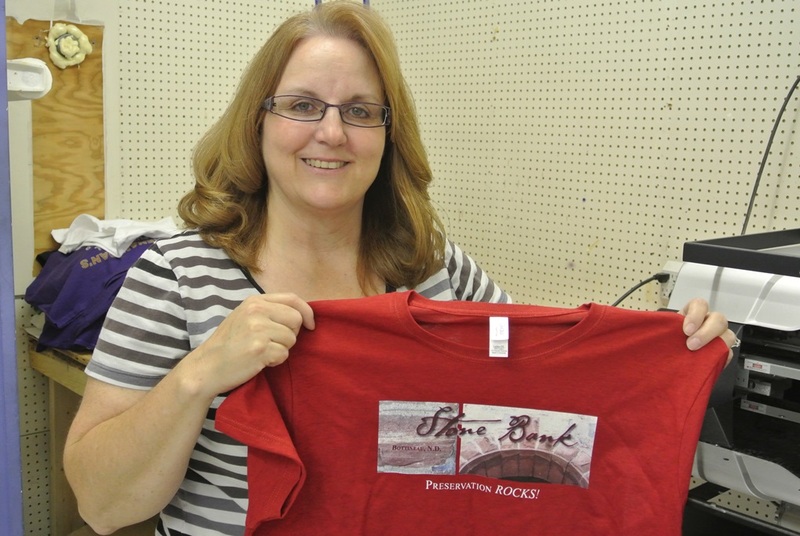 The Stone Bank T’s were made in Bottineau by Echoe Shriver. Get yours today! You can order your T-shirt online or stop by 4J’s Sporting Goods on Main Street in Bottineau. Echoe Shriver has the T’s on hand and can even make one to order in minutes. Of the $15 for the shirt, $10 goes to Stone Bank restoration work. We have T-shirts from petite to 3xl for women and from medium to 3xl for men. It’s a little thing, but your support means a lot to the project. Our goal is to raise the back of the building this fall and get the roof on. That takes money. Every donation moves us closer to that goal. Can you help? Send an order by email, by mail or gives us a call. Our contact information is in the right column of this page. You can also use our handy PayPal site to order your T-shirt. If you don’t like wearing a T-shirt, why not dedicate a stone to a loved one? All the details are on our website. Four people used our online giving portals today to send some love to the Stone Bank. There are 2.5 hours left in Give to the Max Day. We don’t need the max… We need a little. On Razoo.com, search for zip code 58318 and you will find the Stone Bank! Come on. Make my day! The three dumbest guys I can think of: Charles Lindbergh, Steve Jobs, Winston Churchill. Why? Because any smart person who understood how impossibly arduous were the tasks they had set themselves would have pulled the plug before he even began. Ignorance and arrogance are the artist and entrepreneur’s indispensable allies. She must be clueless enough to have no idea how difficult to her enterprise is going to be — and cocky enough to believe she can pull it off anyway. 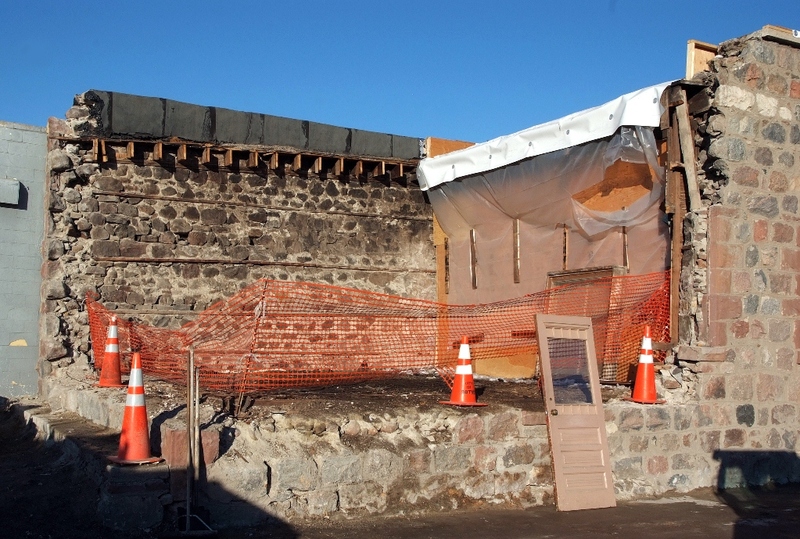 What we know for certain is that restoring a 112-year-old stone building isn’t easy — in fact, it’s very heavy, hard work. And we’re not just talking about lifting the stones. There are doubters. There are those who would like to see it go away. Others can’t see past the challenge. But what would Steve Jobs, Charles Lindbergh or Winston Churchill do? They would press on, rally some support and make a difference. And that’s what we plan to do. So consider this your rallying call. We need to push ahead on the restoration of this gorgeous, endangered building — and we need your support. And by support, we mean we need a donation from you. We have $25,000 in grants, but we need to completely match those grants with local support to get the work done. There are sexier causes, but this is a project where your contribution is huge. Please join us in being “stupid.” November 15 is Give to the Max Day. A day dedicated to putting the money where our hearts are. Is the Stone Bank in your heart? Then “act” and send a check or click either the Razoo link or the PayPal link on this page to make a donation on your credit card. Then call yourself “stupid” and smile, because you have helped do something that lots of people think can’t be done. What we know is that it CAN be done. And it WILL be done. Thanks for your support and thanks for reading the Stone Bank Blog. Greetings from Stone Bank fundraising HQ where we have some news to report. But first, let’s pause for a lovely picture of the Stone Bank. Stone Bank at dawn on a clear, cold October morning. It simply glows in the light. We are pleased to report some incoming contributions for the Stone Bank Project. 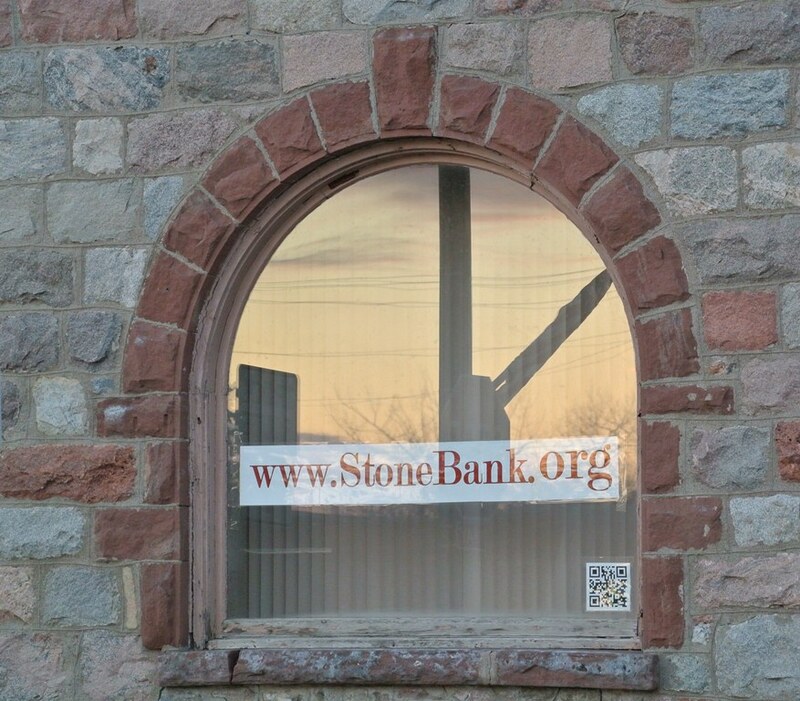 A list of recent supporters is posted on top of the Stone Bank homepage. Thank you. Thank you. Thank you. We needed that. And that. And that. Also, to make things easier for online giving, we have opened an account with Razoo. Ra-what? You ask. Razoo is a national company that works with nonprofits around the country to raise millions for great causes like ours. We have posted a Razoo “donate” button on this page and on the Stone Bank’s homepage. No need to find an envelope, a stamp and remember our address — just click and give! Nearly 100 percent of your donation comes directly to the Stone Bank. (For instance, a $100 online contribution will bring $97 to the Stone Bank. Very fair for the ease and accessibility of the service. Give it a try. There are several other great Bottineau nonprofits on Razoo, too. 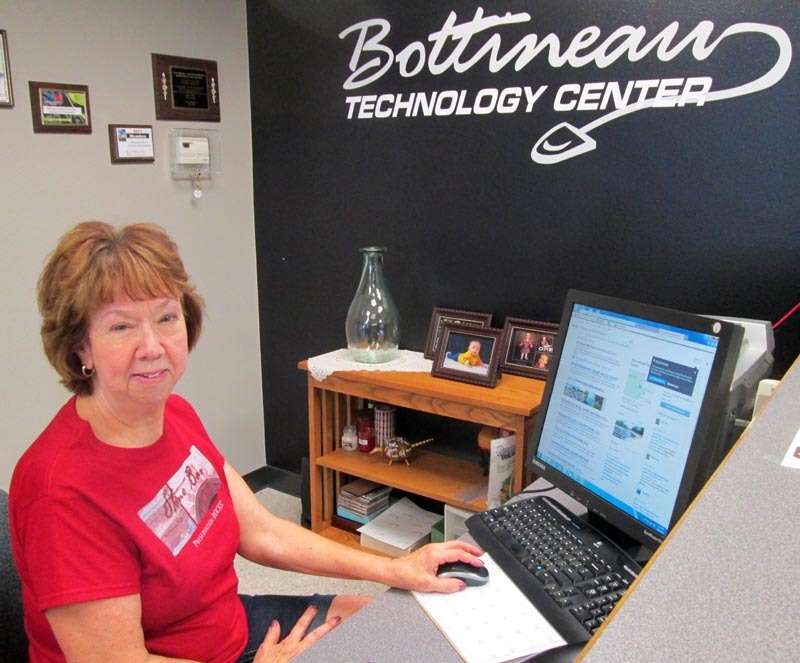 Just search for Bottineau’s zipcode — 58318 — to find other worthy projects. Did you know that November 15th is Give to the Max Day? Nonprofits across the country work to get out end-of-year donations on the National Day of Giving. We hope when you think of charitable giving that the Stone Bank Project is near the top of your list. And then you take action. This is a critical time for your support, because at the end of the month our stone mason will finish dismantling the back 20 feet of the building. Your donations create the matching funds we need for $25,000 in grants that support this project. The stone wall at left in this picture and the remaining rear foundation will be dismantled in late November 2012. Rebuilding over a new foundation is planned for 2013 with your support. This fall’s work will ready the project for its “rebuild phase” in early 2013. So, Razoo to you! It’s a great way to help the Stone Bank Project move ahead. Thanks for reading the Stone Bank blog. We appreciate your interest in our project. Here’s another early morning shot of the bank. Charming and pretty! 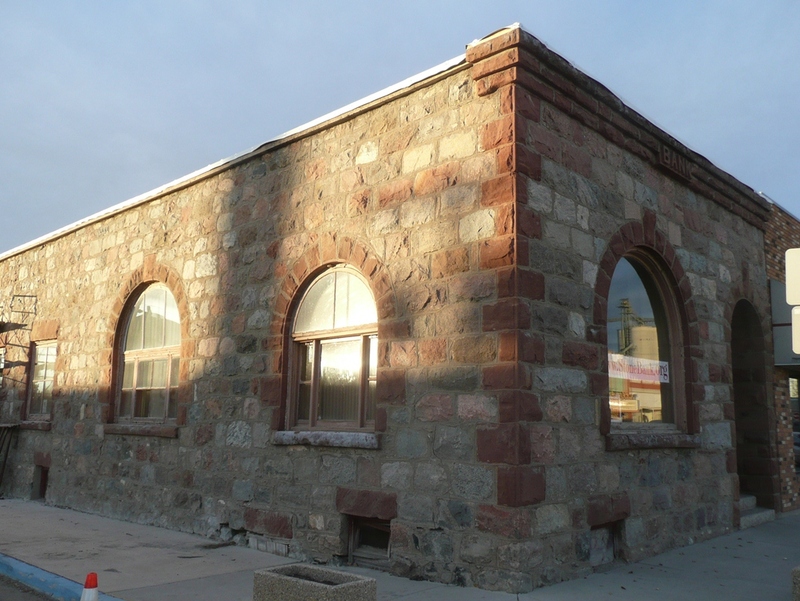 It glows in the light — and you’ll glow, too, knowing your contribution helped bring this historic building back to life. Dawn’s light glows in the front window of the Stone Bank. For your Stone Bank blogger, it was disappointment for lunch, when the call about a grant came at about lunchtime. And no, we didn’t even get a little bit of what we wanted. A representative of AgriBank called to say that although the Stone Bank is an interesting project that they had decided against sharing their oil-lease riches with us in the form of a grant. Seems that even though the grant information said they were looking for projects of cultural and historic value that there were, uh, constraints on that. Let’s just say that the instructions were vague. The result? In the short term, the Stone Bank won’t have the financial boost needed to help move the project along. That brings us to (the very fitting) Stone Quote #5. Inscribed at the International Peace Garden’s Peace Chapel — quite near the Stone Bank. 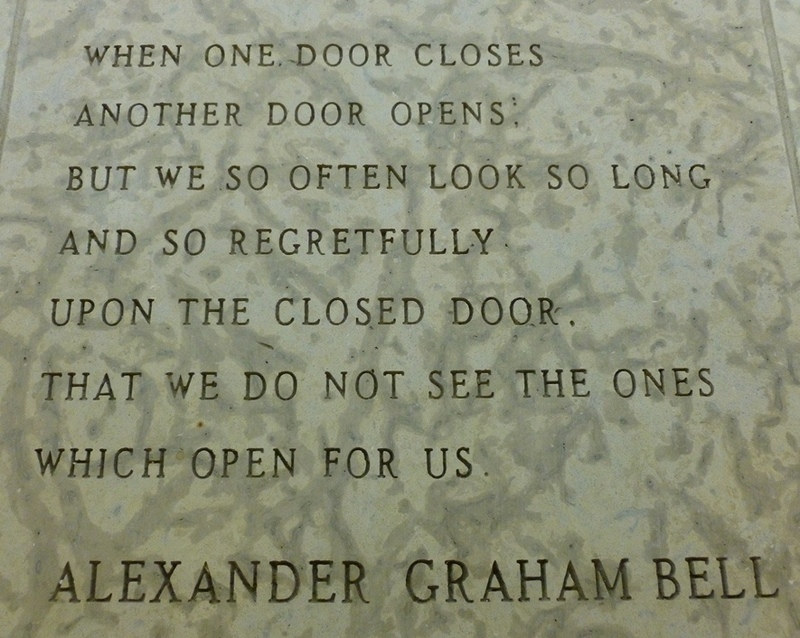 That Alexander Graham Bell was one smart cookie. No regrets! We will just move along and keep working on this great building. A door will open — and it will ROCK! In the meantime, tell all your friends, relatives and passersby that they can do what AgriBank didn’t do. They can support the restoration of the Stone Bank. There are lots of details on our website: StoneBank.org. Chin up. Tally ho. Thanks for reading the Stone Bank Blog! We interrupt “Ireland Week” for a wonderful announcement! 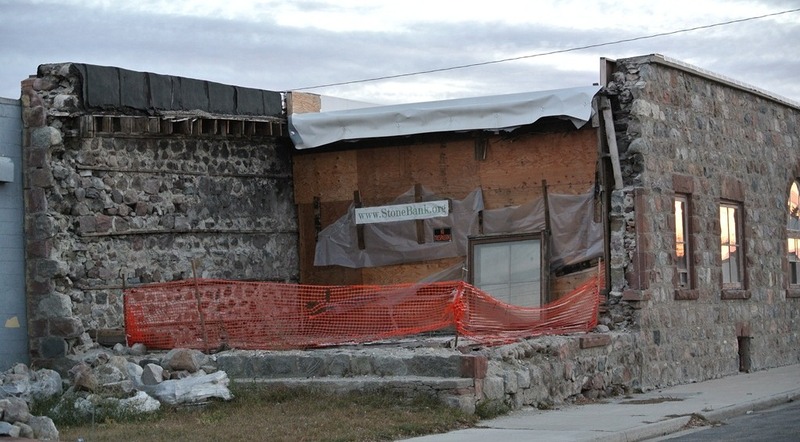 The Stone Bank Project has been awarded a $20,000 grant from the State Historical Society of North Dakota to continue restoring the building! Woo Hoooooooooooooooooooo! We couldn’t be happier, because this puts us on the road to making serious progress on restoring this landmark 1890s building. Our current plan is to fix the foundation under the 20-foot section that was dismantled last fall and then to begin rebuilding the back of the building. Perhaps you have noticed the “Donate” button on this post. Yep. We need to match that grant with local monies — and that will take your help. Using the PayPal link allows you to send money from a credit card or your bank account. And your donation is tax deductible. Our fundraising goal for 2012 is $60,000. This grant award gives us a HUGE leg up. Can you help? We are proud and happy to receive donations of any amount. Thanks for reading the Stone Bank Blog. The Stone Bank in profile. At the far left of this photo, the scaffold stands during the dismantling project. Now, we focus of rebuilding. Now we return to the fun and frivolity of Ireland Week. ROCK ON! And thanks for reading the Stone Bank Blog! Your Stone Bank blogger is working on the Stone Bank’s finances — and, well, our project is running on empty. We had cost overruns with roofing and the dismantling of the back of the building. And we want to pay our contractors! Our rockin' Stone Bank T-shirt! You should have one! Go to http://StoneBank.org for our PayPal link or send a check to Touchstones, Inc. at 511 Ohmer St. in Bottineau, ND 58318. Thanks for your interest in the Stone Bank! It’s coming soon! The delightful one-woman show “The Truth About Women and Horses” is set for Nov. 4 & 5 at the Holwell Auditorium in Bottineau. A fun show and a great cause. Be THERE. Call 701-871-0309 for reservations.